As Hong Kong's "Umbrella Revolution" enters a dangerous phase, government censors are clamping down on social media sites used to communicate images of the protest to mainland China. Thousands of young pro-democracy activists, camped out under umbrellas to ward off humidity and tear gas, filled the streets and surrounded government buildings today. And as the mainland government and police warn of chaos unless the protestors give up their demands, there also is a battle being fought in the digital trenches. First Instagram was apparently banned Tuesday, when mainland users couldn't access the site. Now there are reports that China's largest mobile messaging app, WeChat, is also being blocked. Until now, WeChat was not censored in Hong Kong, reports The South China Morning Post. But the Occupy Central protest marks the first time Hong Kong users have experienced blocked posts, although, the publication says a few protest images made it past the censors. The BBC is also reporting that messages posted to Chinese microblogging site Sina Weibo are censored. 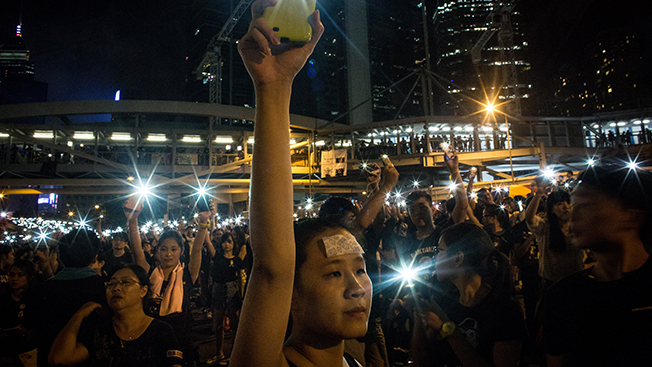 But just as Tiananmen Square protestors used faxes to communicate with the outside world in 1989, millennial activists in modern Central Hong Kong have found ways around the censors. FireChat users communicate with one another over Apple iOS7's Multipeer Connectivity Framework, which essentially connects phones without WiFi or Internet. And it works even if mobile phone service is down. San Francisco-based Open Garden makes the app, and its CEO told the BBC that 100,000 new accounts in Hong Kong were created within 24 hours. The app messages are public and anyone can join the conversation, including mainland Chinese, who some student protestors claim are spreading misinformation and abusive posts. There are also reports that mainland cyberspies have targeted iPhone users with a virus called Xsser, which can steal text messages, photos, call logs, passwords and other data. The activists also are using drones to get aerial protest videos to social media outlets. Digital warfare aside, the message is clear: They'll use any available technology to tell the world they want Hong Kong's chief executive to resign.